Timer with delayed pulse function for automatic star/delta motor starters. Fixed time range: 1.5-60sec. The time is adjustable on the front. 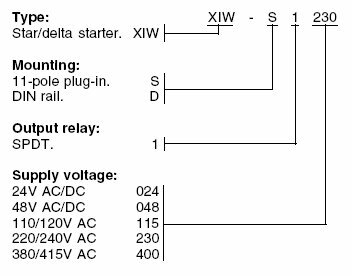 The timer is available in different versions for AC and DC supply voltage and has a single relay output. Versions available for DIN rail or 11-pole plug-in mounting. The timing period starts when supply voltage is connected and the LED lights up (low intensity). When the preset time has elapsed, the relay is energized for 75msec. and is afterwards de-energized again. The LED lights up (normal intensity) when the relay is energized and remains lit until supply voltage is disconnected. When the supply voltage is disconnected, the timer resets.